Abstract: In this review PCSTATS will be evaluating the Power & Cooling Silencer 750 Quad power supply. The 750W Quad is a unit that hardware enthusiasts should like. In the computer industry competition is intense, and when it comes to high end PC hardware manufacturers always have to prove that their gear is worth our cash... half the time it isn't. Yet in this landscape of faux-sumer Best Buy and CircuitCity shelves packed with PC parts blazoned wth "Extreme" and "Ultra", there are a few PC hardware brands with undeniable street cred. We're talking real credibility, the kind that a flashy gold font embossed on the side of glossy cardboard can't duplicate. Asus is one of the most widely recognized examples, Plextor another. For power supplies it's a trifecta - PC Power & Cooling, Antec, and Seasonic . For as long as I can remember, PC Power & Cooling has represented the pinnacle of computer power supplies. The company has a very loyal consumer base, particularly among enthusiasts who dread voltage drop under load. When overclocking was more of an underground hobby, before it became the commercialized catch phrase of marketing driven brands, many genuine enthusiasts chose to run finely tuned benchmark busting PCs on a PC Power & Cooling power supply. Why? Well back then there wasn't anything else as good. The desktop computer market has matured significantly since then, and very good excellent power supplies can be found from just about every brand. PC Power & Cooling still has it's street cred, but faces a lot competition. And this is where OCZ Technology enters the picture. Last year OCZ Technology bought PC Power & Cooling for an undisclosed amount of money, and since then enthusiasts have been wondering if OCZ would mess with a good thing or leave it be. That's something we're going to explore today, it would be a shame if OCZ screwed up PC Power & Cooling. It's somewhat reassuring that prior to the take over, OCZ's branded power supplies were generally good, though in no way on the same level as PC Power & Cooling. 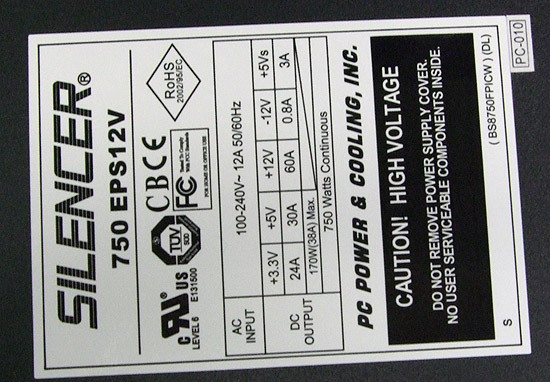 In this review PCSTATS will be evaluating the Power & Cooling Silencer 750 Quad power supply. The 750W Quad is a unit that hardware enthusiasts should like. The Silencer 750 Quad has been nVIDIA SLI certified (it has four PCI Express videocard power connectors), runs at 83% efficiency and can deliver 825W of peak power. Team that up with a five year warranty and tech suppor and you have a comprehensive package. With a retail price weighing in at $177 CDN ($190 USD, £90 GBP), the Power & Cooling Silencer 750 Quad will appeal mostly to enthusiast users. In the landscape of 750W multi-videocard supporting power supplies the Silencer 750 Quad is priced competitively against comparable products. PC Power & Cooling has never been big on pointless gloss, and the Silencer 750 Quad is as plain as it gets. Painted in matt black, one 80mm fan up front. No fuss, no gimmicks, just the way PCSTATS likes its power supplies. The Silencer 750 Quad power supply is longer than the average ATX power supply, measuring but at 180 x 140 x 86mm. The matte black metal casing is refreshingly smudge and fingerprint resistant. The PC P&C Silencer 750 Quad is cooled with a single temperature controlled 80mm fan positioned at the back. At the front of the power supply housing are vertical slots which allow air into the power supply. During testing the 80mm fan could not be heard and you wouldn't notice it once installed into the case. We prefer honeycomb venting generally, so it's possible this is one area where OCZ has had an influence cost cutting. The Silencer 750 Quad is compatible with the ATX 2.2 spec standard which means it supports the 24 pin ATX power connector by default. Pins 21-24 are detachable so the Silencer 750 Quad PSU will function with legacy 20 pin ATX motherboards. According to the label, the PC Power & Cooling Silencer 750 Quad will deliver 224 amps on the +3.3V rail and 30 amps on the +5V rail, for a total combined power output of 170W. There is one single 12V rail, and it outputs up to 60 amps! As we mentioned, the Silencer 750 Quad's wattage rating is a Sustained Output Value, not Peak. There is a big difference. The Silencer 750 Quad can reach a max of 825W during peak loads. The PC Power & Cooling Silencer 750 Quad supports Active Power Factor Correction (A-PFC) which improves efficiency, reduces heat and uses less power. A-PFC circuitry works with a wider voltage range (115VAC of North America to 230VAC of Europe). The power supply even comes with a full 8-1/2" x 11" printed test report from the factory.